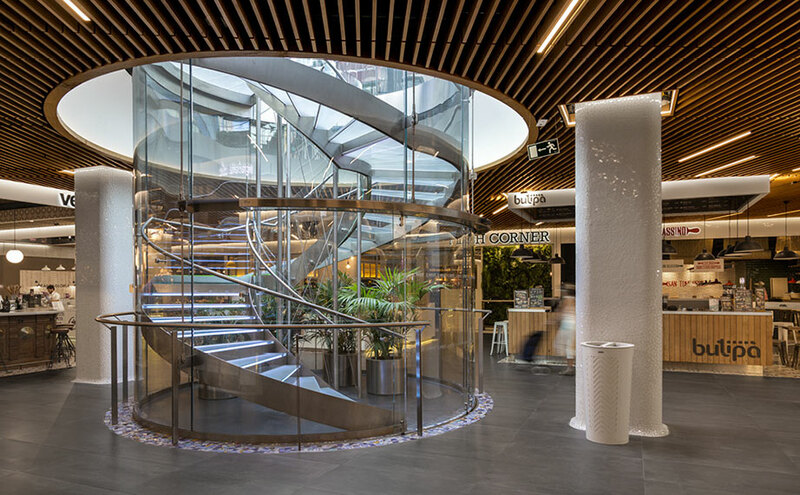 Opened in 1995, created as an urban renovation in Barcelona, in 2016, the expansion and renovation of Les Glòries Shopping Mall was undertaken. This encompassed “El Mercat”, a new restaurant concept in which we can find Mediterranean, signature, Italian and Japanese cuisine both to sample in the restaurant and to take home or to the office. The company of Santa Perpétua de Mogodo, LINING TIME, was in charge of transforming the Solid Surface from PORCELANOSA Group. We can find KRION® on the countertops of both the men’s and women’s bathrooms, and even on the special baby-change counters. The signs, located on the ceiling, which indicate the different establishments, are also made with KRION® 1100 Snow White. However, what really attracts one’s attention is the dome of the spiral staircase that allows us to access the open plaza of Les Glòries, a piece that is spectacular due to its size and circular shape, with imperceptible joins. It is a new application of KRION® in a high transit public space, in which our solid surface, as has been demonstrated in a multitude of projects, is notable for its ideal aesthetics and function.